Gravy is a quintessential comfort food – no matter how, or with what protein, it ends up on your plate. Smother your sausages, coat your potatoes, or dip your meatballs with mushroom gravy… There is absolutely no wrong way to eat it, and no good reason in the world not to love it. Of course, becoming Paleo comes with some substitutions: you’ll want to skip the thickening wheat flour, instead replacing that with tapioca starch, or eliminating it altogether. Sauces and gravies can achieve a certain “thickness” with time, as you reduce the ingredients slowly over heat. So, what kind of steak will you choose to add to your mushroom gravy? An obvious choice is grass-fed sirloin tips. Once you have tried that, you may want to move onto a slightly more impressive tenderloin steak, gradually working your way up to a filet mignon with a mushroom and mustard sauce. With plenty of prep/cooking/eating experience under your belt, you will find that grass-fed meat actually does taste the best. If you are so inclined, you can add a dash of coconut aminos or apple cider vinegar for a more unique flavor. You can also include a teaspoon or two of Dijon mustard, toss in a few tablespoonfuls of coconut fat, or sprinkle in some red pepper flakes. The important thing here is that you make this gravy recipe yours – to your liking. Food tastes the best, when it is just what you ordered! Sauté the mushrooms, garlic and onions until they are lightly browned, about 4 to 5 minutes. Pour in the stock and whisk, scraping the bottom of the pan. Season to taste, add the rosemary, and cook until the sauce reduces. You can also add 1 tbsp. tapioca with 1 tbsp. of water to the sauce to thicken it. In a skillet, melt more cooking fat over medium-high heat. Place the steaks in the skillet and sear both sides for 2 to 3 minutes, depending on the thickness. Turn the steaks every minute, basting regularly with the fat, until it reaches your desired doneness. 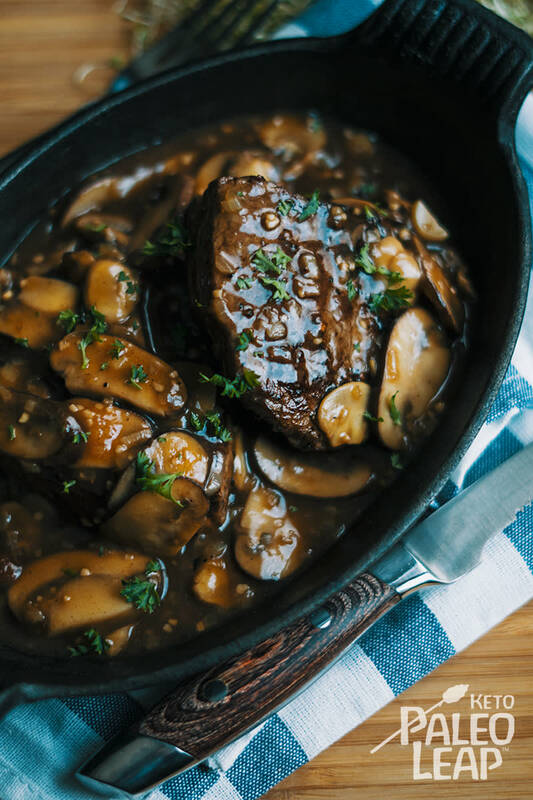 Serve The steaks topped with the mushroom sauce.